The legendary – and legendarily intrepid -- Margaret Bourke-White shot the magazine’s first cover. (She was also the first Western photographer allowed into the U.S.S.R, the first accredited woman photographer in WWII, and the first to fly on a combat mission.) Bourke-White loved the overhead vantage point and, indeed, some of her most famous pictures were taken from airplanes. Here, she looks down on the frantic yet seemingly choreographed buzz of men milling about on 36th St. between 8th and 9th Avenues in the heart of New York City's Garment District. 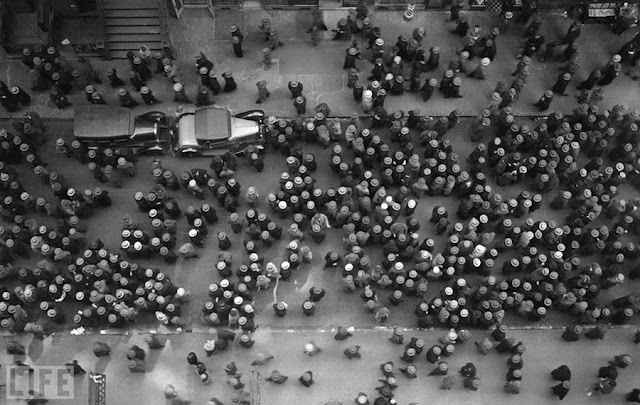 Margaret Bourke-White i-au placut peisajele facute de la inaltime si, intr-adevar, unele din cele mai celebre fotografii ale ei au fost facute din avion. In acest caz, aici ea surprinde, uitandu-se in jos, vanzoleala frenetica insa aparent urmand o anumita coregrafie, a furnicarului de oameni de pe strada 36, intre bulevardul 8 si 9 din inima Districtului Garment din orasul New York.